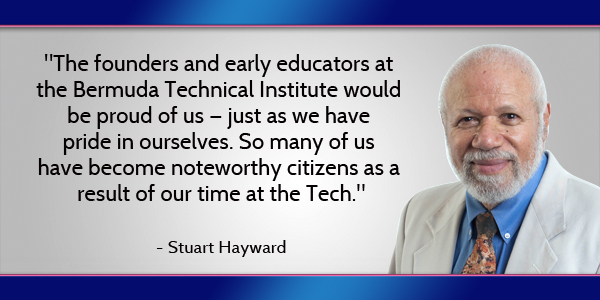 “Your efforts to revive technical education are worth pursuing,” Stuart Hayward told attendees at the Bermuda Technical Institute Alumni [BTIA] reunion event at the Fairmont Southampton. The event served to mark the 60 year anniversary of the Bermuda Technical Institute, an educational institution which was closed down in 1972. Speaking at the gathering, Mr Hayward said, “When I entered The Tech in 1956, I had already attended three elementary schools and two high schools. I had a reputation as a smart alec kid. My own mother said I was too smart for my own good. “My problem was that along with having a sharp mind I was high-spirited. I was very quick to pounce on people’s mistakes, especially mistakes of teachers. I was quick with retorts and what I thought were funny quips. It got so bad I was suspended from school a couple of times. “With my antisocial attitude I was headed to being a successful misfit: under-educated, under-informed—a bright failure. The teachers at the Tech turned me around. Sid Rumbelow, mainly, helped me to see my long-range choices: a rewarding life as a successful citizen versus strings of trouble followed by chains of punishment. I chose the former. 1. Unlike most other schools, the Tech was brand-new and didn’t have the baggage of an anti-educational culture . 2. Most of the teachers believed in us and they told us so, helping us believe in ourselves. 3. As an all-boys school our hormones weren’t distracted during the school-day from the presence of teenage girls. 4. Most of the boys were eager to learn. 5. It wasn’t that we didn’t do academic subjects at the Tech — reading, writing and arithmetic were part of our curriculum — but they were related and complementary to our vocational work. We needed chemistry to understand welding, mathematics to calculate and measure the mechanical things we built or repaired, English and grammar to write up the results of our experiments and experiences. “My experience at the tech was different than most in my class. I was already a functioning ”academic” student. What I needed was relief from the boredom of traditional school life. The Tech presented me with real-life mechanical problems that engaged my intellect. “An example: The school couldn’t afford a theodolite, which is an expensive, precision surveying instrument. So, in typical Bermuda Technical Institute fashion, our teachers decided we would make one. The big challenge was how to measure and engrave the circular, horizontal plate with lines marking out 360°. “I came up with the idea of using the gearing on the school’s engineering lathe to measure out and line up each of those degree marks. It worked and the teachers commended my idea. “Now I don’t know if that theodolite ever got built. But the recognition and sense of self-worth I got from solving the problem completed my transformation into a model student. “The point I am making is that it’s a two-way street. For non-academic students, technical training boosts the desire for academic coursework. At the same time, academic students benefit from having real-world practical problems on which to hone their intellects. I would go so far as to say that schools without a technical training component deprive their students of the best that education can offer. “In the same way that our academic subjects at the Tech were challenged and fulfilled back then as a complement to our technical abilities, today’s academic students can be enriched through complementary manual skills. “The Technical Institute watered and fed our young minds. Our local and foreign teachers inspired us to generate creative solutions — not only to our academic problems but also to the personal and social problems we experienced at home and at school. “So your efforts to revive technical education are worth pursuing. “One note of caution: I urge you not to let your energy be dissipated or diverted by speculating or dwelling on why the Tech was closed. To paraphrase one commenter on Bernews: “Leave the conspiracy theories with those who cannot exist without them…. Conspiracy stories always sound better when you create an enemy to hate…” Your effort should rise above that. “Also, do not let your creative juices be diluted by what might have been. The Tech was, but it is no more. “It may not be possible to replicate the Tech as we knew it. It may be impossible to bring together all the elements that made the tech so special such as generous teachers, pristine school culture, students eagerly looking for a second chance — but that’s no reason not to try. “The founders and early educators at the Bermuda Technical Institute would be proud of us — just as we have pride in ourselves. So many of us have become noteworthy citizens as a result of our time at the Tech. “Maybe this is the push that will regenerate the Tech. If not the Technical Institute as we knew it, perhaps it will spark the revival of the spirit, hard work, integrated thinking, and creative action that we all got from our time at The Tech. “I wish you success,” concluded Mr Hayward. I can tell you of two attempts over the last few years, to offer to set up a private Tech School here that neither the PLP or OBA were interested in. We obtained buy-in from a number of parties including the BIU – but not Government. So can we do it without government? It’s obviously needed. Not that I don’t agree with you. I posted this on an earlier blog. I think people forget that B.C. has a Tech. Hall and technical programs.I attended when they where at Roberts Avenue,along with many who have gone on and experienced successful careers.It’s great to reminisce, and these alumni have gone on and done great things for Bermuda,but more focus should be on Trade Companies hiring young willing individuals on an apprenticeship bases in which a program (if there is not one now) is in place to share cost of having the youngsters taking certificate course at B.C. at least 2-3 times per week.I honestly believe we have the facility in place to achieve what Tech. did in the early days. Creating and opening a new technical facility under a different name will not get the results I think many believe will be achieved. I am not at all sure the original Tech students were “willing to do courses” or even interested in school at all. I am betting that many, if not most, were completely fed up with education. As Mr. Hayward said, he had already been through 2 other high schools and been suspended several times. If we can get the right teachers, ones who believe in our boys and who have no problems with conveying that belief in words and actions, ones who enjoy opening the doors of creativity in the minds of children and allowing that spark to ignite, who understand that mistakes are not opportunities to criticize and put down but opportunities to learn and grow – then the children who attend that school will become interested and willing. Sadly, we have grown into a culture that seems to take pleasure in pointing out mistakes, being critical, throwing snappy, hurtful verbal put-downs, name calling and insulting the efforts of others – and some of our teachers and many of our parents reflect that culture. This does not create a healthy or encouraging environment for student achievement. It stifles creativity and curiousity for fear of making a mistake. This will not change until each one of us makes the effort to monitor ourselves and how we relate to each other and to the children in our midst. We are the village that is raising our children and we are responsible for our results. This will take an ENORMOUS amount of time, money and effort. Any tech schooling will have to prepare students for the needs of TODAY’s world. The changes in tech from 1972 until now are night and day. Good luck, but this is one heck of a task to undertake. Comparing the old Tech to the Bda College is comparing apples to oranges. One of the keys to the success of Tech was they were taking young males at the age of 11 and 12 and teaching them the right way to carry out tasks, from the right tools to the methods to the calculations necessary to perform the tasks. However the College takes in young men at 17-18 and older. These college students did not benefit from learning the correct methods or how to work out problems mentally before picking up tools. In other words they had picked up bad habits that the College would then have to try to undo. What is needed is technical education in the high schools as a serious path of study for those who do not wish to or are not inclined to pursue a full academic course of study. Academics are important and always were at Tech. The key being at a High School level, not college level.